The TIME Dealer of the Year program honors new-car dealers in America who exhibit exceptional performance in their dealerships and perform distinguished community service. Dealers are nominated by members of the ATAE (Automotive Trade Association Executives) and the winner is acknowledged during the opening business session of the annual NADA convention. Phil Meador, president and owner of Phil Meador Toyota in Pocatello, Idaho, was named one of four regional finalists for the 2016 TIME Dealer of the Year award. Meador is one of a select group of 50 dealer nominees from across the country who will be honored at the 99th annual National Automobile Dealers Association (NADA) Convention & Exposition in Las Vegas, Nevada, on April 1, 2016. The announcement of this year’s national TIME Dealer of the Year and finalists was made by Meredith Long, publisher, TIME, and Tim Russi, president of Auto Finance for Ally Financial, at the formal opening of the convention, which was expected to draw more than 20,000 individuals involved in the automobile industry. In its fifth year as exclusive sponsor, Ally will recognize dealer nominees and their community efforts by contributing $1,000 to each nominee’s 501(c)3 charity of choice. Nominees will also be recognized on AllyDealerHeroes.com, which highlights the philanthropic contributions and achievements of TIME Dealer of the Year nominees. The TIME Dealer of the Year award is one of the automobile industry’s most prestigious and highly coveted honors. Recipients are among the nation’s most successful auto dealers who also demonstrate a long- standing commitment to community service. 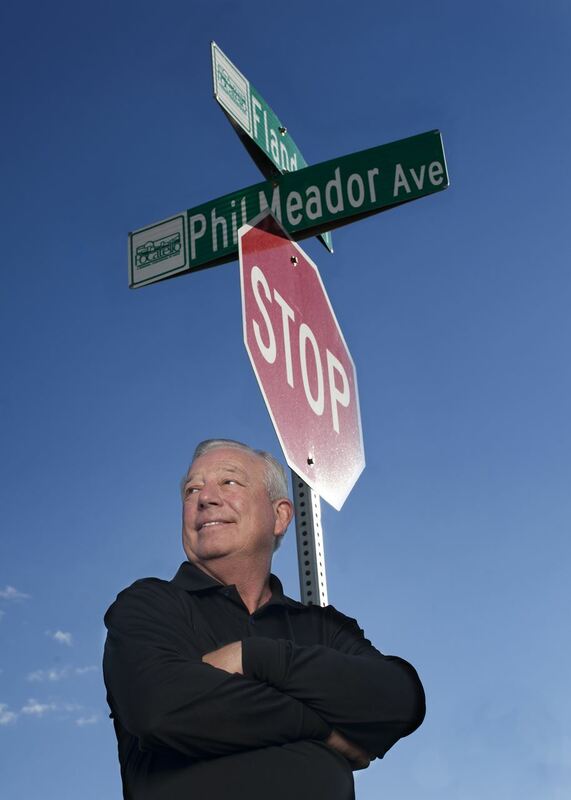 Meador, 65, was chosen to represent the Idaho Automobile Dealers Association in the national competition – one of only 50 auto dealers from 16,000 nationwide – nominated for the 47th annual award. A panel of faculty members from the Tauber Institute for Global Operations at the University of Michigan will select one finalist from each of the four NADA regions and one national Dealer of the Year. One of Meador’s initiatives, Perfect Attendance Spells Success (PASS), offers a mountain bike to each 5th grade student with perfect attendance for the entire year at an area school. “Over the last three years, we have given away more than 1,500 bikes,” he said. “And we increased school attendance by a huge margin.” His dealerships turn into community centers to raise money and awareness for a range of causes. Meador collects food for Feeding the 5000, a local food drive, and held blood and bone marrow events through Angels for Alec. “We have enrolled more bone marrow donors per capita than any city in the United States,” Meador said. He also hosts fundraisers to support the Pocatello Animal Shelter, including drives for pet food and the annual Run with the Big Dogs walk/run, plus collects gifts for children through Toys for Tots and the Salvation Army Service Center’s Secret Santa. Meador is most proud to have been named the number one new car dealer in the Idaho State Journal’s 2015 Readers’ Choice Awards. “We have received this distinction for the past seven years and it is very meaningful to us to be named the people’s choice,” he said. “It means we are doing the right things for those we care about the most.” He added, “But when it is all said and done, I hope that I am remembered for much more than just selling cars." Meador was nominated for the TIME Dealer of the Year award by Kevin Hanigan, VP/Executive Director of the Idaho Automobile Dealers Association.